The other day, seduced at the butchers, the Accidental Locavore’s husband came back with a lovely pork roast to rotisserie. We’ve done them with hoisin in the past, with certain degrees of success. I had seen a recipe for Hoisin and Ginger Spareribs in the most recent Saveur and thought it should work just as well for my roast. My version made enough to marinate the pork and have about a cup left that we heated up and used for sauce. Put everything but the pork in the work bowl of a food processor or blender and process until fairly smooth. Taste and adjust seasonings. Reserve about 1 cup to use as a sauce for the pork. Put the rest in a large Ziploc bag, add the pork and seal the bag. Marinate overnight. About an hour before you start cooking, remove the bag with the pork from the refrigerator and let it come to room temperature. Remove the pork from the bag and discard the marinade. Heat the rotisserie on the grill to high. Cook the pork on high on the rotisserie for 30 minutes. Lower the heat to medium and continue to cook until the pork is cooked through, 160° on an instant-read thermometer, about another 20-30 minutes. Remove from the grill and let rest for 10 minutes. While the meat is resting, warm the remaining sauce in a small saucepan. Serve and enjoy! My verdict: Maybe it was the recipe and maybe it was that we actually let the pork marinate for a couple of days, but this was so good it surprised both of us! The addition of the Szechuan peppercorns I owe to a fellow rotisserie freak, Jeff Parker. They added that really interesting burn that only Szechuan peppercorns can. 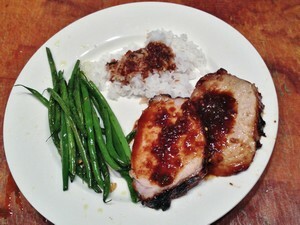 I served the pork with some jasmine rice and poured the sauce over everything. What I kept forgetting was to slice up some scallions to garnish the pork with. This is definitely going into regular rotation, possibly on a duck in the future? If you don’t have a grill with a rotisserie (go buy one! ), you could roast the pork either on a grill or in the oven. My guess for the oven would be 350° for about an hour. If you don’t have cane vinegar, try using rice wine vinegar, or white wine vinegar.